If five days on a train with over one hundred dirty, loud and often-drunk people who boast about never showering sounds like an absolute nightmare then, well, you’ve boarded the wrong locomotive. On the “Big Easy Express,” which screened last night as part of the Nashville Film Festival, it’s Mumford & Sons, Edward Sharpe & the Magnetic Zeros and Old Crow Medicine Show as your travelmates on a journey by rail from San Francisco to New Orleans, where music rattles the cars until five in the morning and the next stage is the expanse of the tracks as they split the countryside in a seemingly never-ending line to both everywhere and nowhere. Emmett Malloy (director of the Grammy-nominated White Stripes concert documentary Under Great White Northern Lights), followed the three bands and many more banjos in the hopes of highlighting the great Americana sound on its original mode of transportation: the train, or in this case, a steely California Zephyr. “It’s like we left all our baggage at home,” says Old Crow’s Ketch Secor, on board with a blue Kodachrone sky whizzing by behind his head, “and just brought our instruments.” And it’s true: though the bands stopped in six cities to play, the real prime ticket was for the show that never ceased while getting there. Despite hailing from different cities and backgrounds, the players unite in seemingly drama-free harmonies, cross-legged and barefoot on the floor, writing new songs and singing old ones, steadying themselves with one hand and clutching a fiddle with the other as the train rattled and shook. The concerts, billed as the Railroad Revival Tour, are shot intimately but frantically, and are interesting to watch as they creep up close on the sweat that forms on the bridge of Marcus Mumford’s nose or catch a sweet embrace between Edward Sharp’s Alex Ebert and Jade Castrinos as they sing “Home,” but it’s hard to top the candid moments on board. 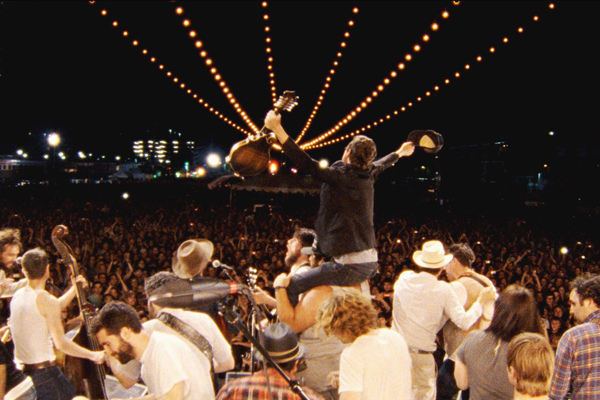 Though when the Mumford men head to an Austin high school to teach its marching band the “The Cave,” and then brings them on-stage later that night, some of the kids are choking back tears as they clutch their tubas and glance out on to the crowd, and it’s hard not to do the same. The pure joy of music, portrayed with so little irony it nearly strikes as cheesy at times, is the real vital theme. Bob Dylan had a fascination with trains: they were what took young folk and blues musicians from towns like Hibbing, Minnesota to Chicago and New York; in the early days, before writing numerous locomotive-themed songs of his own, he played the traditional “This Train is Bound for Glory” as he’d listened to Woody Guthrie interpret it. In Big Easy Express, both Dylan’s American dream and the tune are central to the film, as the members of all three bands come together at the end in New Orleans to play the song bigger and louder than you’ve ever heard it, with accordion players writhing on the floor as they strike the keys and pull the bellows, guitar strings and fiddle bows all moving so fast it’s a whirl of wood and flannel. This is the last stop, but, if the movie has anything to say about it, you’ll be inclined to pick up an instrument and keep chugging along too, equally bound for melodic glory.